We had a great public speaking event last night at Linlithgow. Well done to Colin who lead us smoothly through another meeting at Linlithgow Speakers last night. 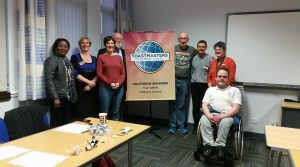 I learned about Helen Blanchard, who I felt I should have known given how long I have been in Toastmasters but I seemed to have missed her ….. look her up if you were not there! The person who impressed me the most was Julie who wanted another shot at the Ah Counter role because she thought she could improve from the last time she did it. That is how we learn in Toastmasters and I hope Julie achieved her goal. Of course, the rest of us thought she did brilliantly on both occasions! Our 2 speakers this evening gave us 2 different approaches. Emma’s was informative about how we can be better communicators and make sure we are understood. She stressed how important the audience is and she is so right! I felt I got to know Susan a little better with her story about arriving in Scotland. She had such an upbeat and positive message and I am full of admiration for the journey she took. Don’t forget to try to use the word of the day “Mettle” in your everyday language over the next 2 weeks (thanks, Claire) – the more you practise the more you will expand your vocabulary – I know I should take my own advice a bit more often! We had 2 very interesting subjects to speak to last night. Firstly, Colin asked us who should be nominated for the Time person of the year. We had some very varied responses that made us think and reflect. The second one was the Table Topics from Euan – he gave us some animals that we had to become and justify why we should be allowed on the Ark. Do not for one moment think that we could be cuddly or useful, oh no, Euan made it a little more difficult than that! I think I got the one that only a virus would vote for – the bed bug. I think we were all challenged to find positive things to say about our creatures (made up or otherwise) and this just demonstrates how table topics pushes us even when we don’t know what we are talking about. What I noticed was that a few of us called back to things previously said – a good technique when you are struggling. It was a very enjoyable session. I have not mentioned all our role takes – that is not because they were not important of worthy of a mention – everyone who contributed did a fantastic job and helped to make the meeting happen. Thanks for everyone’s input. A quick “well done” to Claire for receiving the Enthusiasm Award and Julie for the Best Speaker. Finally, our next great public speaking meeting is on 19th December – we are having a very special guest and a Christmas themed meeting. Hope to see you there.